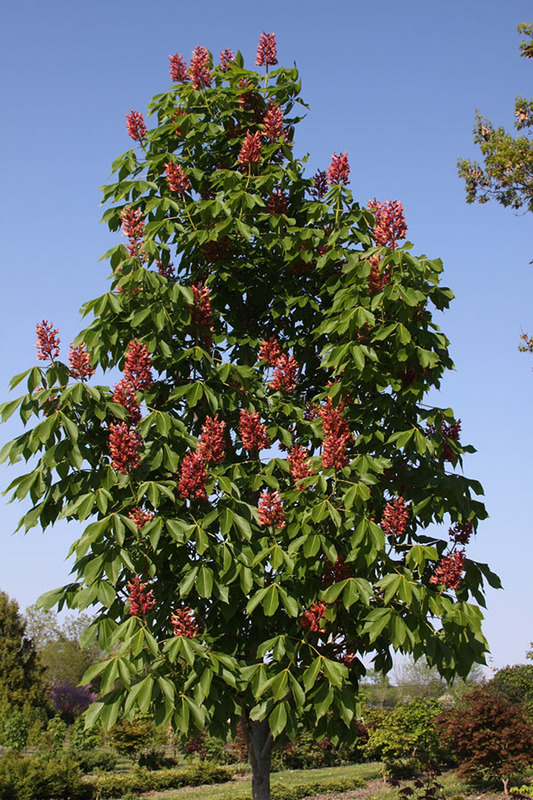 ‘Aaron 1’ is a buckeye tree that arose from a crop of open pollinated Aesculus glabra seedlings at Johnson’s Nursery that were germinated in 1995 (crop-#94S045). It was a chance seedling found by Aaron Jambura in 2003. Aesculus pavia, which was growing nearby the mother plants, is suspected to be the pollen parent. 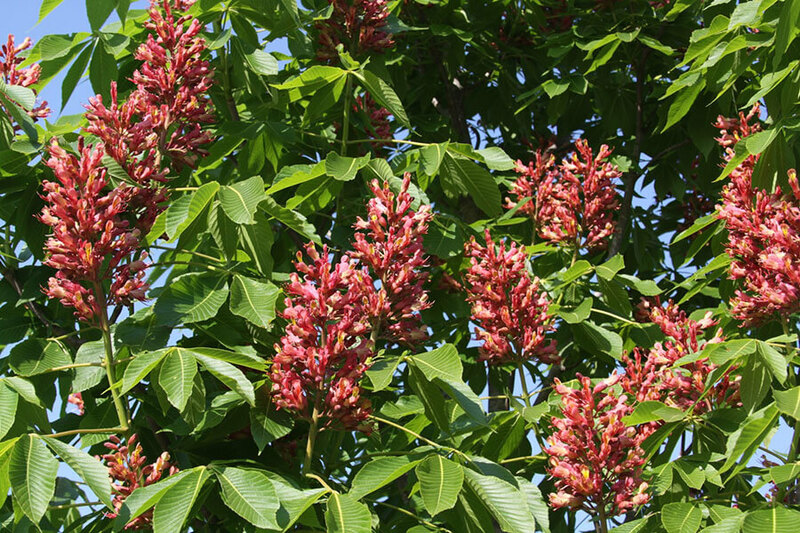 What makes ‘Aaron 1’ unique is the fact that it has beautiful pinkish-red flowers on a tree that is considerably hardier than other red flowered Aesculus. In addition, the tree has excellent foliage qualities with minimal leaf blotch and leaf scorch problems in Southern Wisconsin. The best performing red flowered Aesculus at Johnson’s Nursery over the past 15 years, other than ‘Aaron #1’, has been Aesculus x carnea ‘Fort McNair’. It has had less foliage problems than all other red flowered Aesculus grown at Johnson’s Nursery. It has been readily available as a liner and has had a good demand in the marketplace. The winter of 2013-14 changed the game in that regard for red flowered Aesculus in our area. Virtually all of the Aesculus x carnea trees, 2” in caliper and smaller in the nursery, including the cultivar ‘Fort McNair’, were severely damaged or killed by the winter conditions that year. The ‘Aaron 1’ trees were not damaged. The potential value of this new cultivar has increased as a result. The tree is small to medium sized in scale. The original plant has a 4-1/2” caliper trunk and is 14’ tall by 6’ wide at 21 years old. Plants grafted on Aesculus glabra in the summer of 2003 (crop-#03G003) are 2-1/2” in caliper and 12’ tall by 3’ wide in fall of 2015. So the plants are relatively slow growing even for a Buckeye. 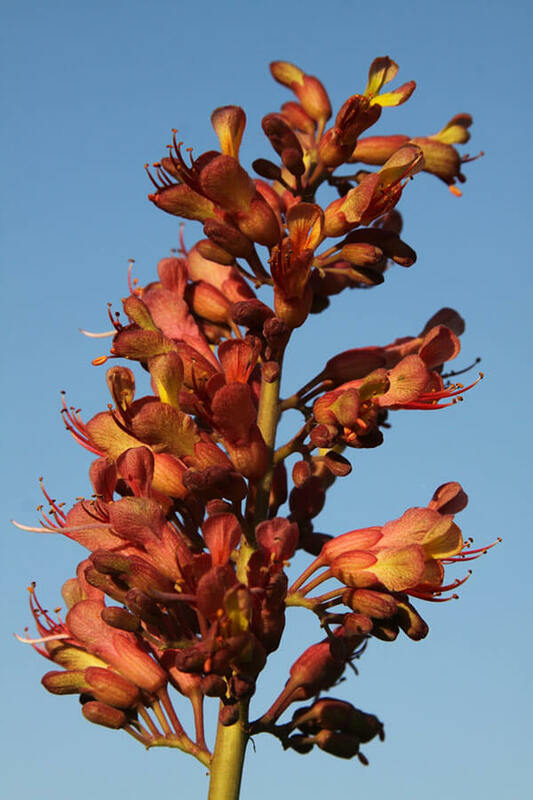 Understocks other than Aesculus glabra may be useful in increasing the cultivar’s growth rate. ‘Aaron 1’ does produce a fair amount of nuts in most seasons and doesn’t fall color to any extent in fall. The plant transplants readily and does best in full sun to partial shade with moist well drained soils. This cultivar is co-owned by JN Plant Selections, LLC and Johnson’s Nursery.